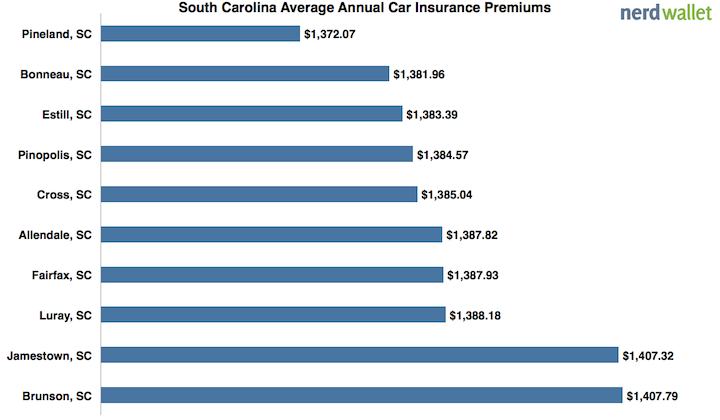 If you’re a resident of the Palmetto State, odds are that your South Carolina auto insurance premiums are already below average. While the average national auto insurance premium is $1,510, South Carolina drivers pay only $1,257. But as most drivers know, premiums vary widely within states, and South Carolina is no exception. The average driver in Brunson shells out $1,408 for car insurance, while a driver in Walhalla will pay only $1,098. Not sure how your area stacks up? 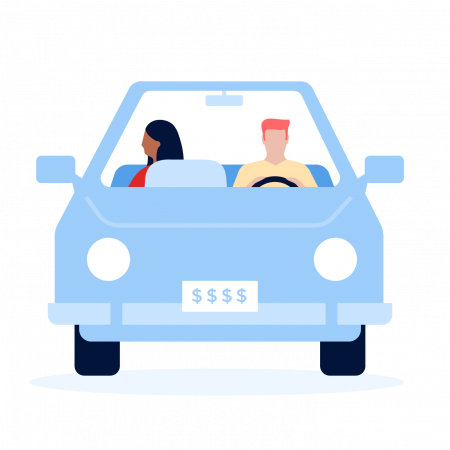 NerdWallet did the math and determined the most and least expensive communities for car insurance in South Carolina. NerdWallet analyzed rates for four driver profiles in 313 South Carolina communities. We gathered rates for 27-year-old unmarried men and women, driving a 2012 Toyota Camry with 25/50/25 limits on their personal and uninsured motorist liability coverage. We also found rates for 40-year-old married men and women, driving a 2012 Ford Escape, with the same liability limits. The difference in cost for the most and least expensive communities is $309.74. On average, male drivers pay $31.60 more than female drivers in South Carolina. Car insurance rates are highest in the southern part of the state; four of the most expensive communities are in Berkeley County. A combination of good weather and legislation keep South Carolina auto insurance rates generally low – like other states with manageable premiums, South Carolina does not have no-fault laws. South Carolina also has a relatively low rate of uninsured motorists – 9% – and a statewide program that encourages residents to report auto and other insurance fraud. Many factors contribute to insurance premiums, so it’s difficult to say why southern South Carolina residents pay higher premiums than other state residents. Hampton, Allendale and Jasper counties have low rates of traffic collisions and fatalities compared to the rest of the state, while Hampton and Allendale counties also have some of the lowest rates of vehicle theft. The relatively low population densities of these counties should also rule out traffic congestion as a cause. However, the link between lower levels of education and higher insurance premiums has been well documented, and may be a factor in our findings. Curious about how your auto insurance stacks up against South Carolina, or the national average? Click here to check out NerdWallet’s car insurance tool. Drivers in Brunson, one of Hampton County’s smaller communities, come in first in terms of premium costs. Here, 27-year-old men and women pay around $1,644 and $1,555, respectively, and 40-year-old men and women pay about $1,255 and $1,273. If you’re looking for something to do in Brunson, check out the Brunson Museum. The site features exhibits and artifacts, detailing Brunson’s past, as well as that of other nearby communities. Once the town hall, the octagonal building has also been featured on Ripley’s Believe It Or Not for its unusual architecture. The average car insurance in Jamestown is just a few cents cheaper than Brunson’s. Jamestown is in Berkeley County, which lies in the southern part of South Carolina. Jamestown sits at the intersection of highways 41 and 45, and it has a reputation for being a speed trap. In fact, in 2009, officials estimated that speeding tickets accounted for $195,000 of the town’s $313,200 budget. With a population of only 115, Luray is one of the smaller communities in Hampton County, and its residents pay the third highest car insurance rates in the state. In Luray, 27-year-old women pay an average of $1,539, and 40-year-old women pay an average of $1,264. For men, 27-year-olds pay around $1,626, and 40-year-olds pay around $1,246. Though it’s not the biggest town in the area, Luray residents still get to participate fully in the daily life of Hampton County. The Hampton County Chamber of Commerce provides a variety of services to newcomers and residents, from maps and advertising, to scholarships for high school seniors. With the highest auto insurance premiums in Allendale County, women in Fairfax pay an average of $1,567.43 if they’re 27 and $1,066.43 if they’re 40. Younger men pay about $1,657.43 each year, while older men pay about $1,260.43. Fairfax also has its share of historic landmarks. The Virginia Young Durant House is on the National Register of Historic Places. It now serves as Fairfax’s library. Like most of the county, Fairfax is primarily rural, and the timber and agricultural industries are large employers. Allendale is virtually tied with Fairfax in terms of average annual car insurance costs. Here, 27-year-old men and women in Allendale can expect to pay around $1,892 and $1,749 for their auto insurance, respectively. As for older residents, 40-year-old men and women will pay about $1,270 and $1,290, respectively. The county seat of Allendale County, Allendale is home to the University of South Carolina at Salkehatchie, as well as a number of landmarks on the National Register of Historic Places. Visitors can stop by the Erwin House, the Gravel Hill Plantation or Roselawn, all historic homes in the town. Allendale County is also known for the Topper Site, an archaeological site that dates human life in the area to more than 16,000 years ago. Cross has the second most expensive car insurance in Berkeley County. In Cross, single 27-year-old men and women can expect to pay $1,605.71 and $1,518.29, respectively. Located on Lake Moultrie in southern South Carolina, Cross is home to many vacation homes. Many Cross residents work as guides, and visitors to Lake Moultrie can enjoy year-round fishing. Lake Moultrie is full of catfish, crappie and bass. Pinopolis, like Cross, is in Berkeley County. Its average car insurance rates are also close to Cross’s – just 47 cents cheaper. Pinopolis, however, is much larger than Cross with 948 residents. Pinopolis has two historic districts: Pinopolis Historic Distric North and Pinopolis Historic District South. They are home to many buildings from the 19th century, many of which were built in the Queen Anne style. Pinopolis is located at a relatively high elevation compared to the rest of southern South Carolina, and it was founded in 1845 as a retreat for the area’s planters. The second largest city in Hampton County, Estill residents pay slightly lower car insurance than their neighbors one county north. Estill is a small town just north of Savannah. Like Allendale County, this area is heavily agricultural and farming and timber are big business. Residents might also work at Archer Daniels Midland or at Ecogy Biofuels, other local employers. Visitors to Estill might come for deer or turkey hunting, both popular in the area. Bonneau is the final community from Berkeley County to make the top ten. Residents spend on average $20 less in annual car insurance premiums when compared to nearby Jamestown. Like Cross, Bonneau sits on Lake Moultrie, though directly on the other side. Francis Marion National Forest and the Palmetto Trail surround the community. In Bonneau, one can find many interesting birds such as wood storks, peregrine falcons and osprey. A community in Jasper County, Pineland residents pay the 10th highest rates for car insurance in the state. Younger men and women pay somewhat higher rates – $1,617 and $1,537 per year on average – than their older neighbors; 40-year-old men and women pay around $1,242 and $1,091, respectively. Another one of the area’s smaller towns, Pineland’s residents can easily access events around the county. Ridgeland, the county seat, hosts a farmers market every Friday and has a variety of historic sites – including the Old House Plantation and Honey Hill-Boyd’s Neck Battlefield – to visit. The Jasper County Chamber of Commerce also hosts regular events including an annual oyster roast and after-hours events at local businesses. What do other South Carolina residents pay for car insurance? If you’re looking for the lowest car insurance rates in South Carolina, some urban and heavily touristed areas actually make the cut. Hilton Head and Clemson drivers pay some of the lowest rates in the state. The absolute lowest rates belong to the residents of West Union and Central, located in Oconee and Pickens counties, respectively. Whatever your town, it’s important to comparison shop for car insurance to make sure you’re getting the lowest rate. It’s also important to stay up to date on insurance regulations and requirements. South Carolina residents can check the South Carolina Department of Insurance for more information.